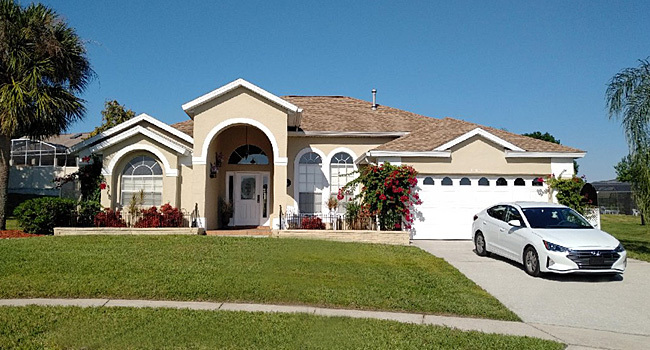 Welcome to Greater Groves Villa which is our 4 bedroom home in the Greater Groves community in Florida, U.S.A. We hope you find what you are looking for in our home and look forward to hearing from you should you require any further advice. Our home is an executive 4 bedroom, 3 bathroom villa with a very large spacious site and heated swimming pool. It is set in a private cul-de-sac approximately 10 minutes from the Disney attractions in the Greater Groves community about 2½ miles north of the US192/US27 intersection. The residential development is a mature area having a spacious feel with wide roadways, sidewalks and a community centre with children's play area, tennis courts, volley ball, basketball and a full size community swimming pool. It has been completed and is free from all of the distractions of a construction site. The villa sleeps 8 people in the 4 bedrooms. The bedrooms comprise the first master bedroom with superking bed and en-suite bathroom, the second master bedroom with a king bed and en-suite bathroom, the third bedroom has two twins (3'2" wide) and the fourth bedroom also has two twins but has linen to make up a king-size bed when both twins are placed together. There is a third bathroom shared by bedrooms 3 and 4. All bedrooms and the family room have ceiling fans as well as the air conditioning system to help you enjoy the environment. Our games room houses the ultimate in fun with a sofa for the spectators... We have a 7ft pool table, twin basketball shootout, foosball, dominos, cribbage, chess, checkers, rummy and playing cards. We have FREE high speed WiFi Internet access for your laptop, iPad or smartphones to allow you to check your emails or browse the Internet. Our management company is a local family run business which has a very high standard of service. They carry out all of our cleaning and they maintain the swimming pool, gardens, air conditioning, washer, dryer, dishwasher, microwave etc to make your stay as enjoyable as we can. Here are some links we use for park tickets and car hire. If you need a Sat Nav unit, they are on the car hire website under their Hire Types, such a Gold Inclusive GPS.